It was rotavated and sown in February on an area that had been under a dense thicket of half-dead apple trees and damson and plum suckers. I figured it had been so dark under there for years that it was worth just going for it without waiting to see if there was a terrible weed problem waiting in the soil. Here's how it looked back then. My hunch proved a good one, as the only weeds to germinate in any numbers proved to be Swine’s-cress and Common Cudweed, both small and easy to ignore. A quick reminder that an area of cornfield wildflowers is not a meadow. Meadows are perennial mixtures containing fine grasses on poor soils that don’t need annual cultivation, whereas a cornfield mix is a range of annual flowers that can be grown on richer soils and where the soil is cultivated each year. I sowed a mix at a rate of about 2 grams per square metre with seeds of Cornflower, Corncockle, Corn Chamomile, Corn Marigold, Field Poppy and Opium Poppy, and augmented it with about 2 grams per square metre of a mix of wheat, barley and oats to get the true cornfield effect. Boy, it took time to get going! Each day I’d wander through it watching for the signs of germination and willing the little seedlings to grow, grow, grow. I even had moments when I doubted it would ever come to anything. There was a point in about late May when the seedlings seemed to knit together into a green carpet. 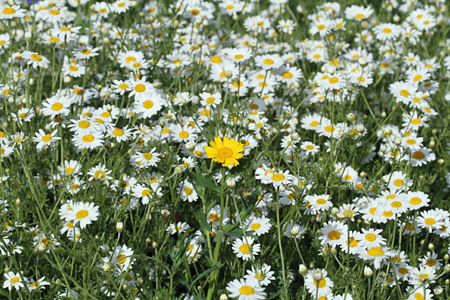 And then the Corn Chamomile threw up thousands of flower buds. But they too appeared to stall, tantalising me. 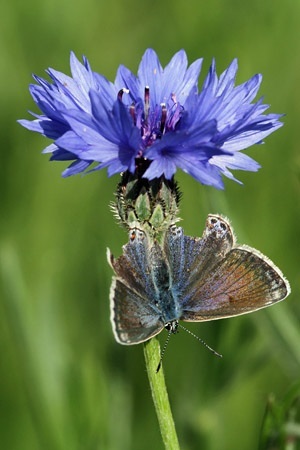 ...and then the electric blue of the Cornflowers. And you can see wildlife has started to arrive, with a female Common Blue butterfly above, plus bumblebees, hoverflies, and damselflies coming into the massed flowers to hunt the flies. Dunnocks, Blackbirds and Robins are enjoying raiding the ground beneath, and I'm hoping finches and House Sparrows will then come to the developing seedheads of the cereals. We'll see - but for now it is just a matter of enjoying the spectacle. I planted the mix in late May and watered regularly before and after school. June was hot and they shot up but it was mostly massive dandelions, a few poppies, cornflower and daisy. I bought 10 broken pallets from nearby farm this morning to build bug hotel!!!! Thanks Derrick for your encouragement. The conrfield is still buzzing with hoverflies, bumblebees and other insects, but will the birds come once the seeds start to drop? We'll see! Hi Nathanael. Thank you very much for your nice words about the book. 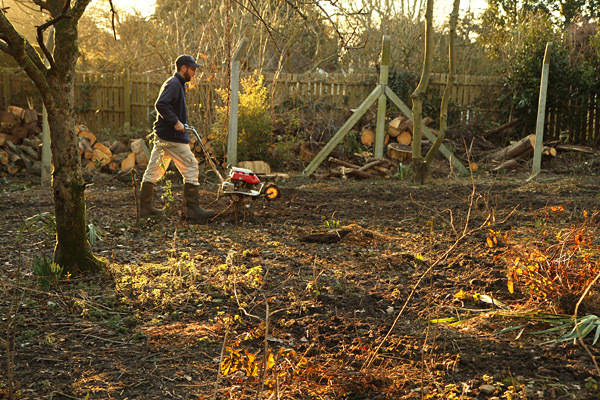 It took 18 months to write, writing every evening after work, and trying to pull together all my ideas after 10 years of gardening for wildlife, so I'm pleased you like the results. I wasn't what you'd call a gardener when I started, but I got hooked! Did you plant the Wilko Cornflower mix? What happened? Brilliant I hope you have a lot of success with the wildlife I think it will be better than putting out feeders, I prefer to see the birds naturally.